The MC-1 Turbo is an excellent entry into the world of high output Moving Coil (MC) cartridges, with an elliptical stylus profile. The MC-1 Turbo has a 3.3mV output, which makes it perfect for use with inbuilt phono preamps – specifically ones designed for Moving Magnet (MM) cartridges. The MC-1 Turbo provides a taste of the linearity and precision of moving coils, but without the need for additional high gain preamps or transformers. 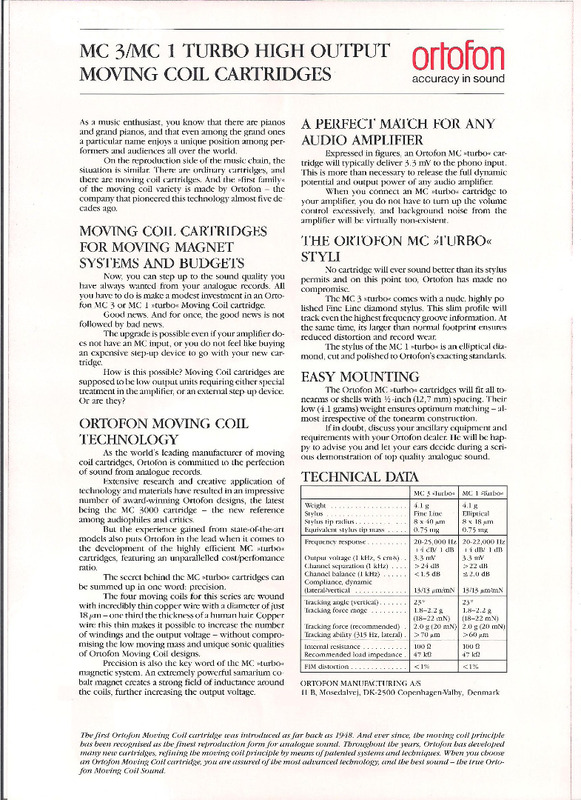 In 1948 Ortofon introduced the world's first moving coil cartridge. Since then, the MC principle has been universally acknowledged as the ultimate sonic performance. Though the high price of moving coil technology and the necessity of an outboard step up device to boost the low output voltage made the MC cartridges a luxury. With the introduction of the first High Output X Series cartridges, Ortofon demonstrated that it is possible to produce MC cartridges with sufficiently high output to eliminate the need for additional step-up devices without compromising the construction principles and unique sound quality of moving coil designs. Ortofon High Output Series cartridges offer you the opportunity to enjoy legendary pure Ortofon Moving Coil sound without the notorious disadvantages of costly extra step-up devices. The high output voltage of the High Output series cartridges is compatible with the normal MM phono input of any amplifier.